Tosanoumi is past his prime, as he himself would agree. The Isenoumi beya rikishi is still present at the bottom of the maegashira rankings, but at 35, his age is beginning to show and it doesn't suit his style of sumo. The Kochi native made his debut at the Haru Basho in 1994 (ranked at makushita 60 tsukedashi) and joined the makuuchi division in the Nagoya Basho of 1995 (at M7e). Since then he has been sekiwake 6 times and komusubi 13 times. He has won 11 kinboshi, 7 outstanding performance prizes, 5 fighting spirit prizes and a technique prize. Unfortunately for him, he has also dropped back to the juryo division twice. He has just returned from there and achieved kachi-koshi in his return tournament. After this satisfying result, he gave his impressions to one of the local daily papers. Tosanoumi, who achieved his kachi-koshi at the Nagoya tournament that ended on the 22nd of July, has come home to visit his supporters associations. On the 25th, he was at a hotel in the town of Kochi for a meeting organised by the sponsor of his regional support group. He talked to us about the last tournament and about his ambitions. Kochi Shimbun: You have now finished two consecutive tournaments with a kachi-koshi score of 8-7. Tosanoumi: Overall my body was in a good state. Even when I lost, most of the time I was going forwards and I was therefore satisfied with the content of my sumo. As the tiredness accumulates, one begins to feel, even before the fight "Today it isn't going to work!" But in this tournament, that has hardly happened. For me, the middle of the tournament is always difficult but thanks to my win by default (Ed: on the 10th day against Tochiozan). I was able to rest for a day. Also, the last two or three days went particularly well. KS: The bout that you didn't fight was your 600th win. Tosanoumi: I found that out when somebody told me. I don't concern myself with statistics or scores. I just thought: "Goodness, I have been fighting a long time!" KS: You are 35 years old. You now belong to the oldest group of wrestlers. 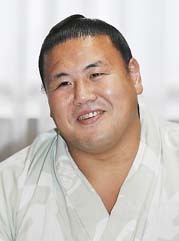 Tosanoumi: Many rikishi stop at 32 or 33 years of age. But normally they stop because of injury. Up to now I haven't had any serious injuries. That might be due to the fact that when one falls forwards, one doesn't get seriously hurt, unlike with throwing sumo (Ed: yotsu-zumo. Tosanoumi, on the other hand, does pushing sumo, oshi-zumo) where, when you fall, your whole body weight comes into play. But there are also some parts of the body which are difficult to protect from injury and up to now I've been lucky. KS: Even in training you need to find some tricks. Tosanoumi: My physical condition is getting worse. If I make myself train like I did when I was young, on the next day and the day after that I will still be tired. People often think that the more you train, the stronger you get, but if you train too hard, then in the end you won't be able to train regularly. As you get older, it becomes important to be sensible. KS: With Toyonoshima and Tochiozan, the number of wrestlers coming from Kochi is growing. Tosanoumi: Even 4 or 5 years ago I wouldn't have believed it. But it's a really good thing! Both of them are young men with a bright future. I want them to surpass me and gradually fight among the top guys. KS: You have rejoined makuuchi division after one tournament and you got your kachi-koshi. You have a chance of getting back into the upper ranks, but what are your objectives for the future? Tosanoumi: No, no, I'm well aware that I no longer have the strength for the upper ranks. I've only just got the strength if I drop back into juryo. But compared to those who had to retire early, I'm lucky. So I'm going to go on for as long as possible. I have decided to retire if I fall to makushita. But until then, even in juryo, I will fight to the end. I didn't set myself an age limit and for now I'm going to take one year at a time. People often say to me: "Your bouts happen earlier and earlier on television". They used to be around six o'clock and there were many people who could watch me when they came home from work. Those fans are now really annoyed, so I would least like to stay in makuuchi.